Prominent & Leading Manufacturer from Mumbai, we offer bimetal washers and aluminum washers. We are specialist in manufacture of Bimetal Washer in copper + aluminium i.e. one side copper and one side aluminium. The copper and aluminium composition is in the ratio 80:20 (80% aluminium, 20% copper). 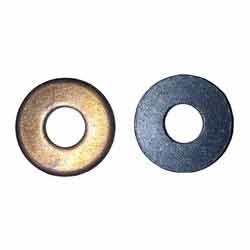 These are plain washers but with two different metals on wither side. We can also manufacture the same according to the composition of copper and aluminium that client require. These can be manufactured in mm & Inches as per your requirements, specifications & drawing or as per the sample provided by client. We are specialist in manufacture of Bimetal Thrust Washer in copper + aluminum i.e. one side copper and one side aluminum. The copper and aluminum composition is in the ratio 80:20 (80% aluminum, 20% copper). These are plain washers but with two different metals on either side. We can also manufacture the same according to the composition of copper and aluminum that client require. These can be manufactured in mm & Inches as per clients requirements, specifications & drawing or as per the sample provided by client. 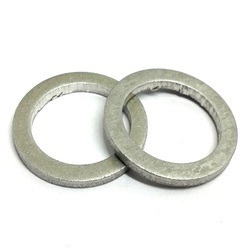 Looking for Bimetal Washers ?